With the 2008 economic meltdown, car leasing nearly went the way of the brontosaurus. Auto leasing fell from roughly 30 percent of new car sales in 2007 to around 9 percent by the end of 2009, says John Sternal, a spokesman for LeaseTrader.com, a website for transferring auto leases. Today, car leasing represents an estimated 16 percent to 20 percent of new car sales. The best auto leasing values are among cars with the highest projected residual value as a percentage of the manufacturer’s suggested retail price. 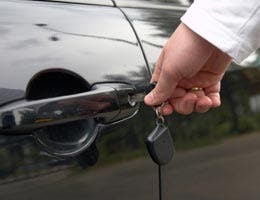 Estimated residual value is what a car is expected to sell for at the end of a specific leasing period. When comparing vehicles to lease, keep in mind that higher residual values typically translate into lower monthly lease payments. 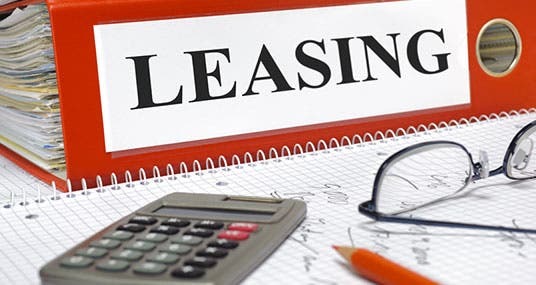 Having this information will give you more ammunition in securing the lowest lease payment possible. Where the vehicle model is in its life cycle, that is, when the model was introduced. Number and strength of other models in a vehicle’s market segment. Current value of a three-year-old version of the same model. Here are the seven best luxury sedans to lease based on Black Book’s residual projections. Bankrate includes destination fees and any applicable gas guzzler tax in the manufacturer’s suggested retail price, or MSRP. 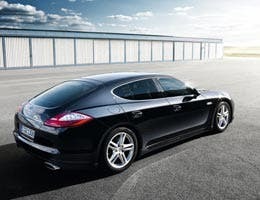 A four-door, all-wheel-drive hatchback, the Panamera 4 seats four in opulent comfort. 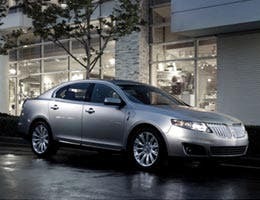 Its 3.6-liter V-6 delivers 300 horsepower and 26 mpg in highway driving. A seven-speed, dual-clutch, driver-shiftable, automatic transmission disperses engine production to all four wheels. Reaching 60 mph from a standstill requires 5.8 seconds. 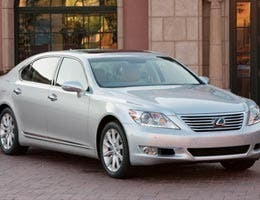 Standard features include: rain-sensing wipers, full power accessories, leather seats, trip computer, dual-zone climate control, hard-drive navigation system, eight air bags, power sunroof, Bluetooth connectivity, an 11-speaker audio system with CD player and eight-way power-adjustable front seats. Under the hood of the CTS-V beats the heart of a ZR1 Corvette. 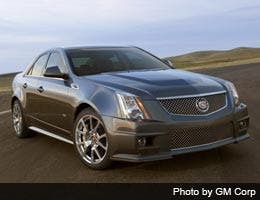 As it appears in the CTS-V, it’s a 556-horsepower, 6.2-liter, supercharged V-8, capable of rocketing this sedan to 60 miles per hour in 3.9 seconds. A six-speed, manual transmission hustles power to the rear wheels. Included in the base price are: leather seats with faux-suede inserts, full power accessories, OnStar telecommunications, trip computer, hard-drive navigation system, dual-zone, automatic climate control, eight-way power-adjustable front seats, and a 10-speaker Bose-infused surround-sound audio system with CD player and iPod integration. 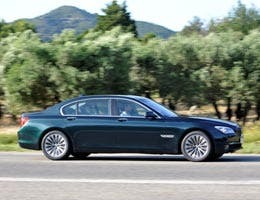 Few big luxury sedans are as much fun to drive as BMW’s 7 Series. Armed with a 400-horsepower, 4.4-liter twin-turbo V-8, the 750i xDrive scoots to 60 mph in five seconds. A six-speed, driver-shiftable automatic transmission ushers engine production to all four wheels. Long and impressive, the list of standard features includes: rain-sensing wipers, full power accessories, napa leather seating, power sunroof, front-rear parking sensors, trip computer, power trunk lid, hard-drive navigation system, 14-way power-adjustable front seats, four-zone automatic climate control, and a 10-speaker surround-sound audio system with CD player and USB connection. Identifying it as the longer wheelbase version, the “L” after “460” means this sedan is equipped with more than 37 inches of rear-seat legroom. Power to the rear wheels comes from a 380-horsepower, 4.6-liter V-8 engine via an eight-speed, driver-shiftable, automatic transmission. Zero to 60 mph takes about 5.4 seconds. Reclining, first-class-like rear seats are optional, but included in the standard features are: rain-sensing wipers, leather seating, trip computer, power accessories, power sunroof, front-rear parking sensors, full dual-zone automatic climate controls, 16-way power-adjustable driver’s seat, 14-way power-adjustable front passenger seat, and a 10-speaker audio system with in-dash, six-CD changer and iPod integration. 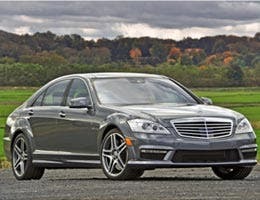 AMG equals high performance, and the S63 AMG has gobs of it. Its twin-turbo, 5.5-liter V-8 pumps out 536 horsepower. A seven-speed, driver-shiftable, automatic transmission delivers output to the rear wheels. 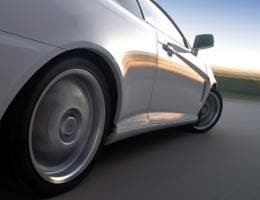 About 4.4 seconds is needed to reach 60 mph from a stop. In addition to enhancing performance, AMG includes appearance upgrades. Among the standard features on this sedan are: full power accessories, trip computer, power sunroof, hard-drive navigation system, 14-way power-adjustable front seats, premium leather, massaging sport seats, dual-zone automatic climate control, and a 14-speaker Harman Kardon surround-sound audio system with in-dash six-disc CD changer and iPod integration. Earning an EPA-estimated 25 mpg on the highway, the MKS EcoBoost AWD draws its propulsion from a 355-horsepower, 3.5-liter, twin-turbo V-6. 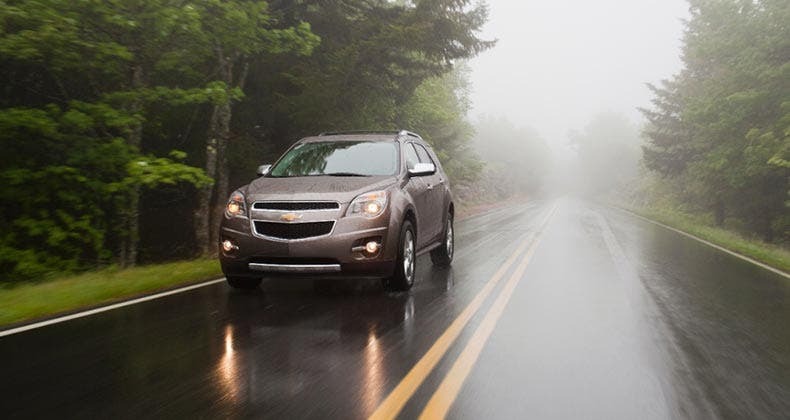 Transferring power to the rubber falls to a six-speed, driver-shiftable automatic transmission. Listed among the standard equipment are: leather seats, full power accessories, rain-sensing wipers, trip computer, Sync voice-activation system, dual-zone automatic climate control, eight-way power-adjustable front seats, and an eight-speaker audio system with in-dash six-disc CD changer and iPod integration. 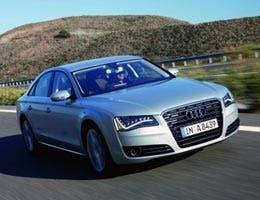 Redesigned for 2011, the Audi A8 is larger and better equipped than its predecessor. An eight-speed, driver-shiftable automatic transmission ushers output from the 372-horsepower, 4.2-liter V-8 to all four wheels. Just 5.7 seconds are needed for the zero-to-60 mph run-up. Standard features include: premium leather seating, full power accessories, power sunroof, trip computer, six air bags, hard-drive navigation system, 12-way power-adjustable front seats, dual-zone automatic climate control, and a 14-speaker Bose surround-sound audio system with CD player and iPod integration. 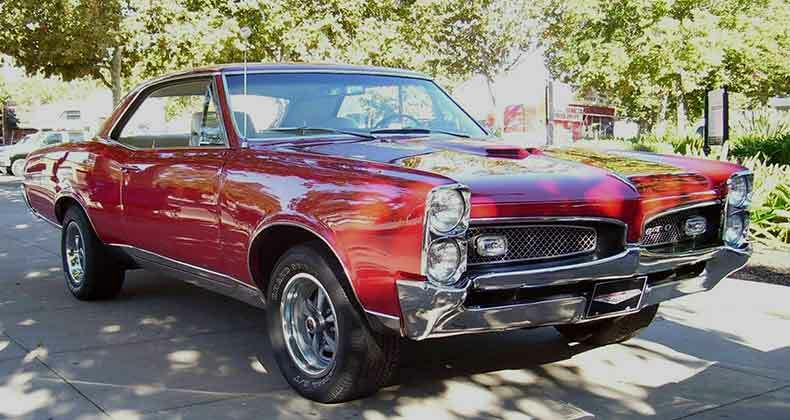 For more information about cars, check out these stories at Bankrate.com. 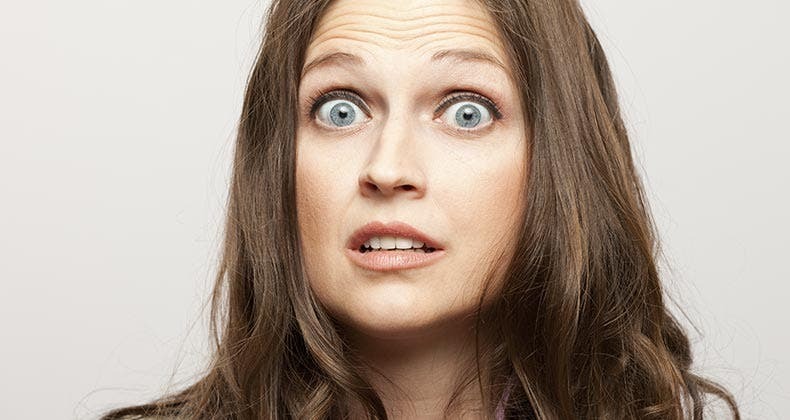 Is minimum car insurance coverage enough? Should you replace an engine or your car?